Thanks for the two lessons. I, for one, did not have much interest in Tai Chi. Susan tried to talk me into it, but I was cool to the idea. Your enthusiasm and patience greatly exceeded my expectations, and your method of instruction convinced me that I should make a serious effort to learn Tai Chi. With the help of the notes and photos taken, Susan and I will practice together. 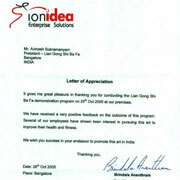 I hope we can surprise you on our next visit to Bangalore. It was a pleasure to meet and get to know you in the short time we spent together. And, of course, thanks to Ashok for making it all possible. I found the exercises helpful and have incorporated them in my regular daily exercises. The Instructions and demonstrations of the class were clear and understandable. I particularly appreciated the stretches for relieving tension in the upper back muscles. Thank you. I have been training with Sensei Avinash for over 2.5 years now. The greatest benefit that I've experienced under his training is the tremendous amount of mental strength and self confidence. Practicing traditional Chinese arts like Lian Gong, Dao Yin, Qi Gong and Tai Chi have undoubtedly several proven benefits, and the health and fitness levels that you achieve through them go a long way in instilling confidence in yourself. But my main source of confidence has stemmed from the martial training that Sensei imparts. His emphasis on mind over matter, on being natural, calm, relaxed and soft, on keeping your nerve even under trying circumstances, takes your confidence in yourself to an altogether new level. Physically, my energy levels, stamina and immunity are all at their peak. I'm happy to confess that I have not come down with either cold or fever for over 1.5 years now, inspite of a very demanding work schedule. I believe that good health, a sound mind and a goal which is deeper than just material gratification is the key to a happy, fulfilling and rewarding life. I am indebted to Sensei Avinash for giving me all three and more. His tireless energy, deep knowledge, extraordinary strength and genuine warmth and love not only make him a great teacher, but also a great human being who not only educates but truly inspires. I still remember my first meeting with Sensei in Jan 2005, it was a super-short meeting that lasted exactly 5 minutes but the impact that had on me was for a lifetime. Had expected a Sensei to be someone who would come across as all knowing and with a superiority mind set but when he spoke the first few words, I realized i was in the presence of a human being who had crossed the thresholds of a normal person and was totally comfortable in the presence of himself. Sensei's genuine passion and extra ordinary expertise in the arts has made him not only a exceptionally teacher of martial arts but going beyond, his love for his students and heartfelt compassion has taken beyond being a Sensei or a teacher of martial arts to being a Life Coach! I starting practicing for physical health but got unexpected benefits in the form of improved levels of patience, lower levels of stress, positive outlook and a larger purpose. Along the way found amazing friends in other students. I have had the good fortune of being a student of Sensei Avinash Subramanyam for a little over a year. The body has its own intelligence, he said, soon after I had joined Seefar. Learn to trust it. That word of advice was particularly telling: I had hardly paid any attention to my body's problems, and was paying a heavy price. As a journalist, I had worked nights for almost two decades. My health was ravaged by the anxieties of meeting deadlines, repaying debts, and coping with circumstances that seemed to unfold in incomprehensible, stressful ways. The graveyard shift, as the night shift is called, wasn't the only cause of my poor health. My body was wracked by chronic pain (attributed by doctors to diabetic neuropathy and fibromyalgia, among other things). After a year of training at Seefar, I can report many improvements. My chronic pain has subsided. Much to my amazement, my body has stood up to the battering of my erratic emotional life. My life has taken unexpected turns, during which Sensei has guided me with the patience and understanding of a saint. Sensei's philosophy combines the courage of a samurai with the compassion of a Buddha. Not all of us can be worthy students, but each of us tries in a small way. His lessons are not just about fitness and health, but also about kindness and karma, spirituality and energy, life and living. Each one of us grows up with a different outlook of life in our mind. Seldom have we realized what we do. In this era, we are more worried about the rat race of achieving name, fame and honor for ourselves. We are neglecting the most important part of our life i.e. our health. We sense it only when it hits back on us. Normally, we abandon our mind, body and soul by not paying attention to know how essentially it is important to align all the three. In today's world, I am sure there are lay people, who don't even bother to know that the mind, body and soul exist. So, folks, stop worrying about power point presentations for once, and try plotting a graph of Time v/s Health. Can you pull a line rising persistently skywards? How is it possible to achieve this? 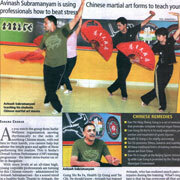 Meet my teacher, Sensei Avinash. Sensei has the best explanation for enhancing/recovering your health. Sensei has been enlightening us on how important our health is, and that, there is nothing that can match this very true fact. Once you start training with Sensei, you will get to know that health is beyond everything else. It is my good fortune I am a student of Sensei Avinash. Simply said . . . as a Sensei, he has given dimensions to our lives . . .
By way of training, we have been able to build, a sort of FORM, which reflects our inner depth, values and mental stance. Ofcourse not the least, physical fitness. Having trained under Sensei my perception of fitness & health has completely changed. I understand health is Physical, mental & spiritual wellbeing. And one needs mental, internal training, mind-body-breath synergy than just physical training. What I specifically like about the training is the holistic approach, its all-inclusive nature- Mind, Body, and Spirit. It's been my privileged opportunity to have found Sensei under whom I can train. Sensei is a friend and guide to us. I trust that his vast experience and knowledge in the subject will only help people learn the arts correctly and thereby reap the benefits of a healthy and good life. It makes hell of a difference to learn from the right teacher. 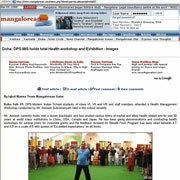 I had the opportunity to meet Sensei Avinash in 2008 when my HR people were organizing an event for our employees. Being an IT manager in my 50’s I was entrenched in a sedentary lifestyle where the only exercise I could get was a round of Golf. I knew I had to focus on my health in spite of the job pressures as age was slowly but surely creeping up on me. I had the usual health complaints like my fellow colleagues in the software business. I was often tired at the end of the day to venture out and have a good time. I had my share of aches and stiff joints due to lack of regular exercise. On top of that constant acidity played havoc with my digestive system. Sensei Avinash taught me Liang Gong, Dao Yin and Taichi (among many other things) religiously over the weekend. He helped me plan my food habits and diet to fortify my system and put my health back on track. I am happy to say that I do my morning exercises regularly and do not last remember when I had stiff joints in the morning or heartburns in the evening. This is not all; being a spiritual person at heart I am learning the subtleties of the above arts that have an impact far beyond the physical body. Thanks to Sensei Avinash, I now find myself healthier and firmer in body and mind. If Sensei can teach me this level of fitness I am sure all my fellow colleagues in the software industry can benefit immensely from his wealth of knowledge and talent. Thank you Sensei for taking such a deep interest in my life and health!! When my husband took me to Dojo to meet Sensei, I thought it was to help me overcome my back problems - little did I know that my life will change forever! Sensei became the catalyst to make my greatest dream a reality – a simple and peaceful life with my little family – my husband and daughter. In the very first meeting, I realized that he is no ordinary person, he is larger than life. Such was the influence he had on me and I had to become his student. I was fascinated by his training, his ways and of course his Taichi – which I thought was divine. The journey from then till now has been simply beautiful, in the last 8-9 months I have been flabbergasted at my transformation – both physically and mentally. The very hot blooded and extremely sensitive person was sculpted to become a more levelheaded human being who could take lucid decisions both at home and office. 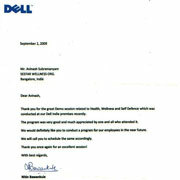 After joining his classes, I have regained my confidence which I had lost during the course of last ten years. I have never come across a teacher earlier, who encourages his students to the extent that Sensei does! He is truly a synonym for the word “Sensei” - one who is respected by all for his knowledge, experience, intellect and skills, one who always strives to pass all that he has acquired in his life to his students and one who is always by your side when you need him the most. I am also astounded at how you won my four year old (who is a hard one to crack) daughter’s love and affection in no time. She looks forward to every weekend so that she can be in Dojo and in your company. Thank you for everything Sensei – love, support, care, encouragement that you shower on me and my family in abundance. Thank you for helping me find myself. More than anything, thank you for helping me and my husband re-discover each other! How does one speak about one's experiences at Seefar and with Sensei without sounding hagiographical? That's my challenge because if I voice my innermost feelings, readers will assume I've gone overboard and have consequently penned a hagiographical sketch or summary. Nevertheless, without being overly dissuaded by such conflicting thoughts, I'd like to talk about my experience. As a person, I am emotional; given to extremes of exuberance and depression; an asthmatic who would tire as easily as a deflating balloon; a prima donna of sorts given to displays of self and a craving for affection from people around me. I am also somewhat confident and count amongst my positives; sincerity and hard work. This was the human package that walked into the Dojo sometime in 2008. I had heard about Tai Chi, watched its display in some videos and was impressed. When I received mailers from Seefar about Sensei's classes, what made me respond was an opportunity to learn something interesting. Beyond this, I had little clue. After a few months, I dropped off like a dried leaf in autumn – work pressures and office politics – I used as my excuse. For two years I did little exercise, ate gluttonously and allowed my health to suffer in general. There were always flashes of Dojo and Sensei and his students before my eyes and then I used to suddenly recall what little Tai Chi I had learnt and tried my hand at it – failing each time. One fine day, I made up my mind to return. Again, what brought me back was the quest for the beautiful form; still missing the essence that drove it. But this time, I paid more attention and it changed my life. See, what occurs at our Dojo is change in the deepest recesses of our being – provided one allows oneself the freedom for such change. The change is in being aware of oneself, one's strengths and weaknesses, generating inherent, dormant positive energy to convert weaknesses into strengths and striving for something higher, becoming better as a human being, becoming positive in one's relationships towards family, friends, colleagues….for all this goodness to personify into tangibles, we train in the arts of Tai Chi, Dao Yin, Lian Gong and a fitness regimen designed by the, in my opinion, the very best of men – Sensei Avinash Subramanyam. It is common place to hear of people talking about "becoming strong" after gym or some such physical training routine. It's very different in Sensei's Dojo. Here, it is common to listen to people become better human beings. Increasing physical and emotional endurance laced with a deep appreciation of the gifts of our senses. About the very real powers of Chi and how being very soft is indeed as lethal as toned steel. "Vajradapi kathorani mruduni kusumadapi" perhaps best defines the nature of our training. No one speaks of building muscular strength but all speak of generating energy through the karma of doing and becoming good. The SMS (Mobile Texting) technique to good karma is so unique as to be worthy of being patented as intellectual property. I'd like to close my note by asking – how does one measure a mighty ocean with a foot scale? It can't be done. The wise will dive in it, try to fathom the deepest depths and swim the longest miles and gain some little insight about its vastness. Fools will stand on shore and blurt out measurements. Our Dojo and Sensei's personality is like that vast ocean. When I dived in the ocean the second time, I saw my asthmatic self train continuously for 3+ hours that included the arts, fitness and a skipping routine that numbered in excess of 400 leaps – without running for my inhaler or gasping for breath. My young daughters are training with me – they are fortunate to have started so early. There is a lot of ocean and we have barely covered the beach-head. Seefar brings about nothing short of a drastic transformation to ones physical, emotional, intellectual and spiritual being. The best way to describe the effect is that it harmonises a person. Regular practice in the various arts taught at Seefar results in increased physical strength, emotional courage and stability and a sharper intellect. For me personally, it has reversed the effects of ageing and has helped me deal with the stresses of everyday life. It took multiple visits to dojo & some months for me to decide to join Seefar. My expectations were limited. I only hoped to find relief for the pain in my back, neck and shoulder. Before I joined the dojo, I had little resistance to colds, allergies, and physical pain. I had many emotional drawbacks, too: I always felt insecure, inadequate, and weak. My self-confidence was low. I got to know about Seefar when Sensei visited AOL (America Online) for a demo, where I was employed. I was stunned by what he and his students demonstrated. I was amazed at how Sensei took hard punches. I was mesmerized by the gentle tai chi movements he executed. But what converted me was the lian gong movements Sensei taught me and my colleagues. The lian gong miraculously (or so I believed) rid me of the pain in my shoulder and neck, accumulated over years of working on my hobby of creating pencil carvings. During the 10 days that Sensei visited AOL for classes, I learnt quite a few lian gong and tai chi movements. Very soon, I noticed changes. I wasn't bothered by aches and pains any more, and I was relatively free from stress. I wanted this change to be permanent . When I joined the dojo, I also learnt some martial arts movements. Through all the fun and laughter we shared as we trained, my learning got deeper. While the martial arts were making me physically fit, Sensei was helping me become emotionally strong. His words of wisdom opened new doors in my mind. What he teaches is what he lives by. It can only be God's grace that brought me to a true Sensei. It took me some time to realize that getting rid of pain and stress was just a happy spin-off of learning tai chi, lian gong, Dao yin etc.,. . These arts actually help an individual realize his self, find true happiness, experience God, give up the ego, give true love, and become one with nature. It wasn't long before I wanted my wife Nandini to join the dojo. I have been here for two years and a half, and Nandini for a year and three months. Getting to be Sensei's students is the best thing that could have happened to us in our lives. I must not forget to mention that, my 7 yrs old daughter is also studying under sensei & the changes I have observed in her during past few months is unbelievable. Because of this training, my confidence has increased. I do not remember my insecurities and inadequacies. I feel lucky to be a part of this dojo as this is the only place I have come across where "what is been practiced / lived, is what's been taught" and "what's been taught , is what applied to life" and that is all about "Live well to die well".